The New Bethlehem area and Redbank Valley community is a great place to live, work and raise a family. Discover things-to-do and enjoy art, history, education and culture. Explore recreational & natural resources including parks, trails and creeks. See ‘Community Links‘ on this page. Click the categories below to view community information. RedbankValley.org/visitors Come to visit and you might just want to stay! 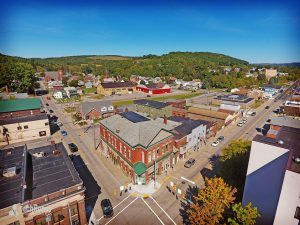 The New Bethlehem area and Redbank Valley community has a ‘Welcome Brochure’ and visitors guide for folks who are new to area or just visiting. Checkout Places to Stay, Places to Eat, Things to Do and much more! RedbankValley.org/attractions Explore attractions & tourism in the New Bethlehem area and Redbank Valley community, including the New Bethlehem Town Center (visitors center, art gallery, history museum, etc. ), Redbank Valley Trail, Redbank Valley Creek, Redbank Valley Municipal Park and more! The Redbank Valley is a great place to enjoy hunting, fishing, kayaking, canoeing, camping etc. RedbankValley.org/location The Redbank Valley area has a central tri-county location along the rolling hills of rural northwestern Pennsylvania, one hour north of Pittsburgh, in southern Clarion County and northern Armstrong County, at the midpoint of the Redbank Valley Trails, centered around downtown New Bethlehem, which lies at the intersection of State Routes 28 & 66, with easy access to Interstate 80. RedbankValley.org/news Stay in the know with local news & sports in the New Bethlehem area and Redbank Valley community, featuring local newspapers/media outlets, and District 9 Sports including Football, Basketball, Baseball, Softball, Soccer, Wrestling, Track & Field, Golf, Hockey and more! RedbankValley.org/emergency Get the latest news and alerts from New Bethlehem, Distant and Hawthorn Volunteer Fire Companies, New Bethlehem Police (Southern Clarion County Regional Department) and Clarion County Office of Emergency Services. RedbankValley.org/history The Redbank Valley Historical Society preserves the history & heritage of the Redbank Valley area and surrounding communities. The historical society produces books, calendars, programs and other historical documentation. RedbankValley.org/art The Redbank Valley Artist Cooperative helps develop, advance and support area arts and tourism by providing arts-related education and cultural programs; studio, display, and sales opportunities and other promotional efforts. The RVAC supports all types of art, crafts, music & culture throughout New Bethlehem, Pennsylvania and the Redbank Valley area. RedbankValley.org/recreation Explore recreational attractions & natural resources in the New Bethlehem area and Redbank Valley community, including the Redbank Valley Trail, Redbank Valley Creek, Redbank Valley Municipal Park and more! The Redbank Valley is a great place to enjoy hunting, fishing, kayaking, canoeing, camping etc. RedbankValley.org/real-estate Browse featured real estate for home, business and rental properties in New Bethlehem, Pennsylvania and the Redbank Valley area. Be sure to checkout the Northwest Pennsylvania Site-selector database for Office, Industrial, Retail, Warehouse and business properties. RedbankValley.org/school Redbank Valley School District & several preschools are located in New Bethlehem, Pennsylvania and the Redbank Valley area. Education-related organizations include the Redbank Valley Education Association, Alumni Association and Education Foundation. RedbankValley.org/church The Redbank Valley Church Association represents ALL denominations and churches in New Bethlehem, Pennsylvania and the Redbank Valley area. You will also find a Church Directory, Scholarship information and Food Pantry (assistance). RedbankValley.org/government Get the latest news & announcements from the Redbank Valley’s Boroughs and Townships, including New Bethlehem, South Bethlehem, Hawthorn, Redbank Township, Mahoning Township, Porter Township and Madison Township.